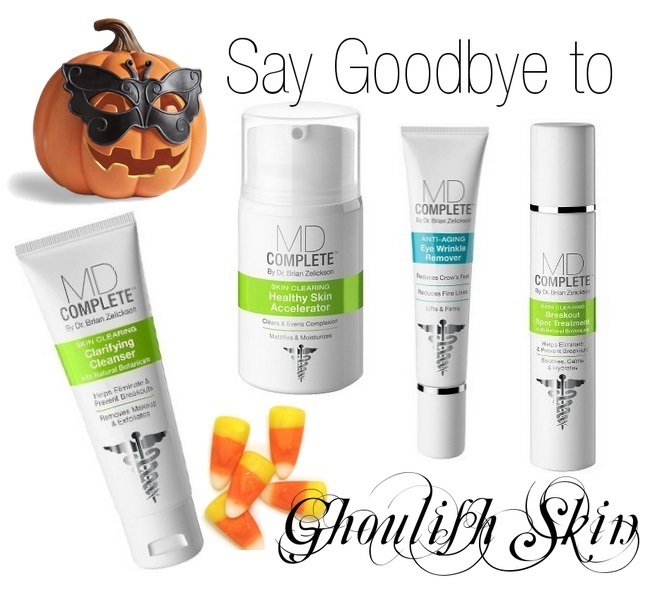 Between the candy, costumes and copious amounts of makeup, there’s no question that Halloween can be scary for our skin. Our costume staples of glitter and face paint, combined with the inevitable over-indulgence in sweets, certainly don’t lend themselves well to a healthy complexion. 1. Protect skin. Apply MD Complete Healthy Skin Accelerator before you layer on your makeup. Its matte finish provides a primer for smooth makeup applicationand serves as a protective shield between your skin and your chosen disguise. 2. Let skin breathe. If you’re going to spend a few hours with face paint on, make sure you choose a formula that allows your skin to breathe. Look for “non-comedogenic” or “oil-free” on the label. 3. Keep skin clean. The most important thing you can do for your skin is to wash off makeup before going to bed. Use MD Complete Clarifying Cleanser (with Natural BOOtanicals) to help prevent clogged pores and breakouts while washing your masks down the drain. 4. Scare away breakouts. If heavy costume makeup caused your skin to go haywire and pimples to pop up, banish breakouts with MD Complete Breakout Spot Treatment. It soothes and hydrates irritated skin, while eliminating the bacteria that cause breakouts. Use it under your costume makeup to treat existing blemishes while trick or treating, too. 5. Stay hydrated. Drinking plenty of water between bite-sized candy bars and sugary cocktails will help save your skin from dehydration and looking ghostly. 6. Don’t be spooked by crow’s feet. Try mixing MD Complete Eye Wrinkle Remover with under eye concealer for costume makeup that performs. Use it around the edges of your lips to fade fine lines and keep lipstick in place, too. Woaaa, that s what i m looking for :P thanks for sharing!! !